In this section I reflect on my understanding of issues relating to copyright, IPR and licensing legislation with relation to Higher Education, and I provide an example of outlining licence recommendations for the Higher Education Coding of Subjects vocabulary. Having worked in the domain of open education for almost ten years, I now have an in depth knowledge of intellectual property rights, copyright, and open licenses and how these apply within the domain of Higher Education. I have worked with Creative Commons (CC) licenses for many years and have a detailed and nuanced understanding of the different degrees of openness afforded by the different CC licenses ranging from CC0 – CC Attribution Non-Commercial No Derivatives Share Alike (CC BY NC ND SA). As a result, I’m often called on by colleagues to provide advice and guidance on the application of CC licences to educational content and open educational resources . This requires a good working knowledge of institutional copyright legislation and an appreciation of the importance of authorship and attribution. Often it’s necessary to explain to colleagues that releasing a resource under an open license does not mean that they are giving away their intellectual property, simply that they are making it available to be reused freely under the terms of the CC licence they have chosen. It’s also important to stress that CC licenses are irrevocable. Once a resource has been released under an open license that licence stands in perpetuity. Rights holders can apply a new license to their content at any point in time, but that does not invalidate the terms of existing licences. In addition, CC licenses are non-exclusive which means that rights holders can release their content under multiple licenses. I’m well aware of the issues and ambiguities of applying Non-Commercial licences to educational content at a time when Higher Education is moving towards increasingly commercial business models. This is highlighted by the case of massive open online courses (MOOCs), which are frequently run on commercial content delivery platforms such as FutureLearn and Coursera. While “educational use” is widely assumed to be “non-commercial” by many within the Higher Education sector, some open content providers, such as national museums and galleries, will not allow their Non-Commercial (CC BY NC) licensed images to be used by MOOCs as they regard this as a commercial activity. In addition to advising colleagues on issues relating to IPR, I have also provided input on open licensing to institutional policies such as the University of Edinburgh OER Policy, and national programmes such as UKOER and the Higher Education Data and Information Improvement Programme (HEDIIP). Attribute HECoS to the appropriate IPR holder, e.g. the governing body or the organisation that authorises the governing body. Grant users a worldwide, royalty-free, non-exclusive licence to use HECoS in perpetuity. Enable HECoS to be used for commercial purposes, e.g. to enable commercial developers to build applications that incorporate the coding scheme. Allow the creation of HECoS derivatives. Allow users to reuse, share and reproduce HECoS in whole or in part. 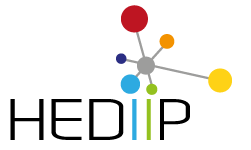 Require users who reuse, share and reproduce HECoS to attribute the IPR holder and refer to the public licence. Include a disclaimer of warranties and limitation or waiver of liability. Recommendation 13 To ensure clarity and usability and in order to prevent the proliferation of customised licences, it is recommended that HECoS is licensed under the terms of the Creative Commons Attribution licence, CC BY 4.0. Recommendation 14 In addition to applying an open licence to HECoS, it is recommended that the HECoS governing body register a trademark in order to protect the definitive version of the coding scheme against misrepresentation. Although I am not an expert in data protection, I have developed a good general knowledge of data protection legislation through my work in open education. In order to be able to provide appropriate guidance on the use of open licenses in Higher Education, it is of critical importance to understand when content, data and information must not be made openly available, for example if it contains sensitive or personally identifiable information. This is of particular importance when it comes to releasing open data. Some HE institutions are exploring new approaches to data management and experimenting with the release of increasing amounts of open data. Some of this data can be released in a relatively raw format as it contains no sensitive or personally identifiable information (e.g. environmental data), other data sets must be anonymised before they can be released (e.g. timetabling and class data), while some information too sensitive to be released in any format (e.g. personal information, medical data) However it is important to be aware that even when data has been anonymised, combining multiple anonymised data sites can sometimes lead the the possibility of identifying individuals. This is a particular risk with small cohorts or data sets. There is no question that Higher Education institutions, quite rightly, take compliance with data protection legislation very seriously, however this has also resulted in many institutions being reluctant to release any data, even non-sensitive data that could usefully be released as open data sets. Having worked in education technology and open education since Creative Commons released their first licence in 2007, it has been interesting to see the growing acceptance of open licenses across the HE sector. One side effect of this is that both teachers and learners have started to become more knowledgeable and less afraid of copyright, IPR and licensing. Although copyright and licensing is still a daunting topic for many, it is perhaps less likely to be seen as the exclusive preserve of institutional lawyers. Arguably one of the greatest benefits of Creative Commons licensing has been to reposition licenses as being enabling rather than restrictive or prohibitive. However CC licences should not be regarded as an endpoint in and of themselves. As the issues around the Non-Commercial clause highlight, they are not a perfect solution. Rather they should be regarded as a step along the way to more radical copyright reform. So, in addition to providing advice and guidance on using CC licences, and making routine use of them in my own practice, I also follow campaigns and developments in copyright reform. For example on International Copyright Day, I blogged about the #ReadAnneDiary Campaign , a campaign led by colleagues in Poland and the Netherlands that aimed to highlight the European Union’s current confusing and outdated copyright framework. Due to differences in copyright legislation across the EU, the Dutch version of Anne Frank’s diary is in the Public Domain in Poland while it is still subject to copyright in the Netherlands and elsewhere. More recently I have supported the campaign to reform EU copyright to benefit education. 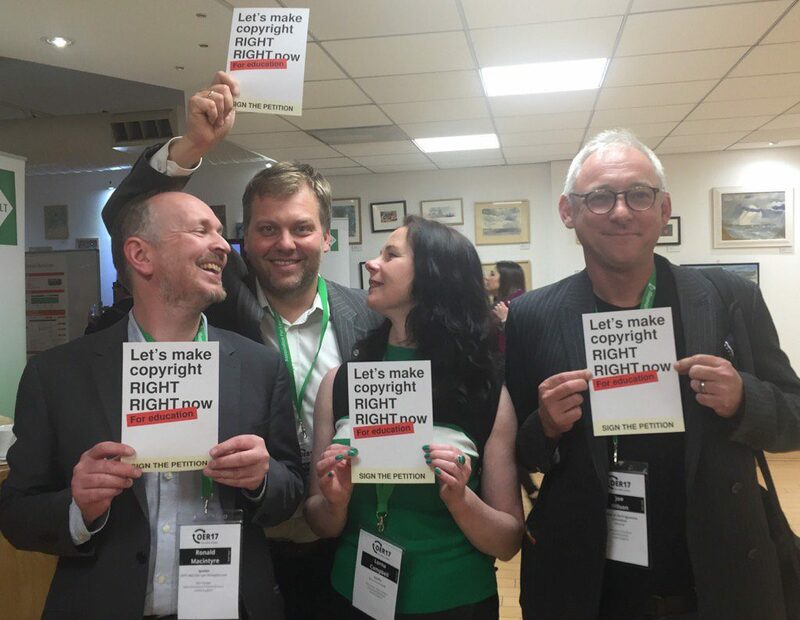 This campaign, initiated by Communia, undertakes copyright research and lobbys the European Parliament to reform EU copyright legislation to meet the needs of teachers in the 21st century. In addition to signing the rightcopyright.eu petition I have also encouraged other colleagues to show their support and have disseminated the campaign widely through my social media channels . Another area relating to IPR and licensing that I am following with interest is the increasing use of public domain. Rather than releasing works under CC license, some cultural heritage organisation are exploring the pros and cons of bypassing open licenses all together and releasing their works directly into the public domain. I’m watching these developments with interest to see how they progress and what, if any impact they have on the education. One of my tweets raising awareness of the European copyright reform campaign.